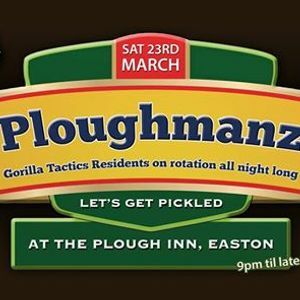 GORILLA TACTICS PRESENTS: PLOUGHMANZ ROUND 2!! We're back at Bristols best boozer...The Plough, Easton for another free entry knee's up. Loads of funky mashup, reggae, dancehall, disco & Jungle flavours for good measure! 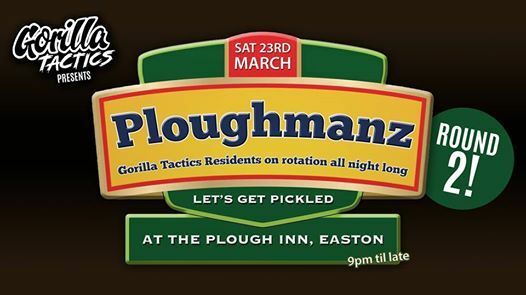 GORILLA TACTICS RESIDENTS ON ROTATION ALL NIGHT FT. SOME SPECIAL GUESTS..
FT. DOLFINS BIRTHDAY CELEBRATIONS AS WELL. DJs from 9pm, 2am curfew.